Our family tries to come together every evening for family supper time. It doesn't always work out perfectly but we try our best. My husband works long hours plus the kids and I are involved in lots of activities. Winter is here and the days can be chilly, it is definitely pot pie season and we love that Marie Callender's tastes like homemade. We can all gather around the table and enjoy a wonderful family meal together. I can either microwave these if in a hurry or bake when I know I have the time. I found my pot pies in the frozen meals aisle at Walmart. I bought pretty much every variety there was. My favorite is the chicken corn chowder pot pie but they are all so delicious. Hot buttery brown sugar and cinnamon apples are a great side dish to any comfort food meal. I picked up a few apples to go along with the Marie Callender's pot pies I had in my cart. The apples recipe is really simple and I make mine in the microwave but you could do it on the stove top if that's what you prefer. 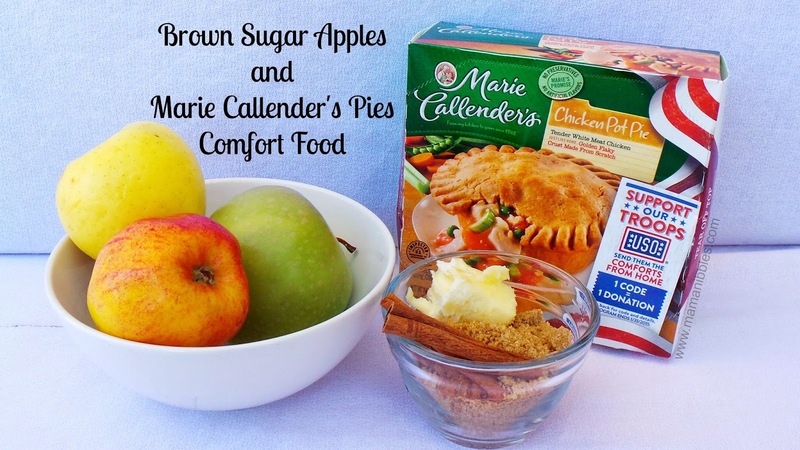 The sweet caramel-y goodness of the apples goes great alongside a savory, golden flaky Marie Callender's pie. Each pot pie serves two and so for every pot pie you make just double the recipe. I make these all the time because they are so easy. The recipe is easy! I make mine while the Marie Callender's pies are near the end of their baking. 5. Let cool for a few minutes as liquid sugar will be hot and then serve after tossing around a bit and taking out your cinnamon sticks. Top with orange zest if you have it. Please check out the Comforts From Home Project to help support our troops! Look for specially marked boxes, go online and enter the codes. Everytime we enter our codes Marie Callender's will make a donation to USO2GO, a USO program that brings things like electronic gear and books to our troops in remote locations. Visit http://www.mariecallendersmeals.com/ to learn more about this product and then check out http://potpieplease.com/ for more great recipes! Marie Callender's also has a Facebook page and I like to follow there to stay updated on news and coupons here.